We will be studying the crayfish population and water quality of the creek along the Museum Road section of the Greenway. 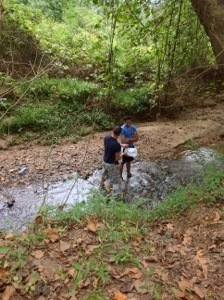 Our main focuses will be the health of the crayfish population and the correlation between their population density and the levels of pollution in the creek. 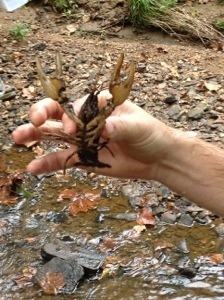 We will capture and study samples of crayfish in four different areas along the creek. We will use contraptions that we have created so we can safely and efficiently capture the crayfish and observe them well. There are four spots we will study; one at the bridge at the beginning, one about a quarter of a mile down, another one at the second bridge, and one further down from that. 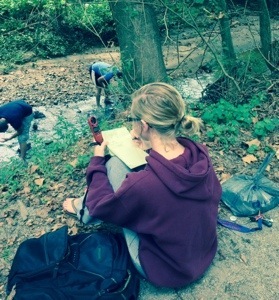 We will compare the data from the different plots along the creek and will also study dissolved oxygen levels and temperatures of the water. Here are some of our latest project photos. The photo of me standing in the lake bed with the long white pole was taken when we were surveying the depth at one of the locations for our cribs. Then we carried them to the sites with the skid steer and set them. Last Friday we started constructing our third type of shelter. It is made of recycled plastic and held together by welded rebar. It basically looks like three of the ugliest fake metal palm trees you have ever seen welded together, but I bet the fish will love it because of all the horizontal cover it will provide. So far Gene and I have put in about 30 hours gathering materials and trying to figure out the best design and location for our fish cribs. We decided to go with all natural building materials. There has been a lot of chainsaw work and stacking logs, so far I have one full size model that we are happy with. I plan to drill holes and put rebar through them to tie them together. I will then weld in caps and support to keep the structures sturdy enough for me to transport them to the lake bed. Monday and Tuesday of this week, Gene and I will be gathering cedar poles to make stake beds for the second type of fish shelter I plan to build. I hope to get some more drilling and welding done on the cribs as well. After some slight design modification, we stacked logs and drilled the corners to run rebar through the holes. I welded a stop on the bottom of each rebar. Once we built the cribs as tall as we wanted, I heated the metal with a torch while Gene bent the metal to secure the logs. Another Biologist (Kim Baker) kindly volunteered about 8 hours hard labor cutting, drilling, and welding. Once we finished the crib I was able to pick it up with our tractor and transport it to the lake basin. We are very satisfied with the cribs and the work we were able to get done this week. One crib down, 3 to go! Biology is way more labor intensive than I would have guessed!